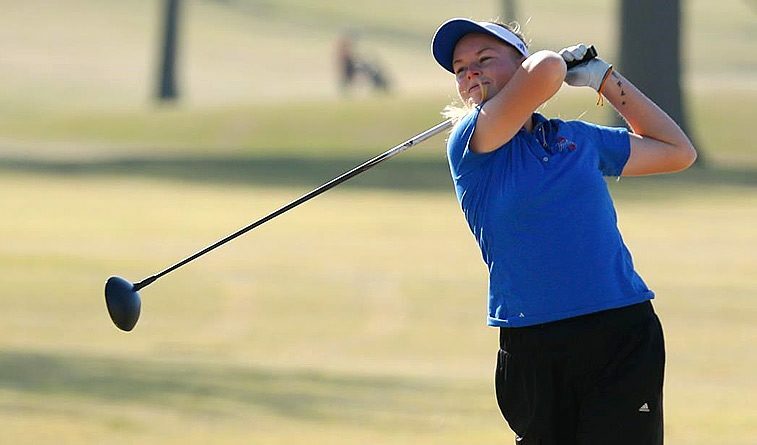 PALM COAST, Fla. – The Tulsa women’s golf team is in 6th place after Sunday’s opening round at the American Athletic Conference Championships, as Golden Hurricane juniors Anneke Strobach and Olivia Jackson are tied for seventh place individually. As a team, the Hurricane carded a first round score of 305, while Strobach and Jackson turned in one-over par rounds of 73 on the par-72 Conservatory course at the Hammock Beach Resort. Nicole Marquardt shot a round of 79 for 33rd place and Johanna Samuelsson carded an 80 for 39th place. The nation’s 23rd-ranked Houston Cougars lead the 10-team tournament field with a score of 291, leading second-place UCF (293) by two strokes. Individually, East Carolina’s Kathryn Carson turned in a 3-under par 69 for first place. The tournament continues on Monday with second round action, and concludes on Tuesday with the final 18 holes.